People assume that because I’m a pastor I pray all of the time. I certainly do pray; but like many of you, I wish I devoted more time to prayer. We all do, so what’s the problem? If you’re like me, you have two big hurdles to overcome (besides time, that is). The first hurdle consists of the feelings of sin and unworthiness that arise when you come to God. It is hard to escape the self-defeating thoughts that enter our heads when we come before the Creator of the cosmos, and our prayer is often railroaded by the dastardly thought that God might not waste His time with us because of our sins. The second hurdle is that when you pray, you feel as if your words go to some vacuous black hole. Instead of clear answers or at least a still, small voice, your efforts are met with a heap of distractions. Why spend time in prayer when the only thing you can think of is how much more you have to do in order to please God, care for your family, and make that next sale at work? In Luke 18:9-14, Jesus told a parable about two men who were praying. The first man was a self-righteous Pharisee who recalled all the good deeds he did for God. His prayer didn’t seem hampered by self-defeating thoughts. The other was a tax collector whose very job labelled him as traitorous and sinful because he was employed by Rome, Israel’s vilest enemy at the time. When he prayed, he couldn’t even look up. Originally, Jesus used the parable to rebuke the self-righteous. The contrast between the two men revealed the tensions that made for some good lessons: Don’t make prayer all about you and don’t think you’re holy simply because there are people worse off than you. For folks like you and me, however, (who are probably neither self-righteous like the Pharisee nor a traitor like the tax collector), there are still lessons to be learned. 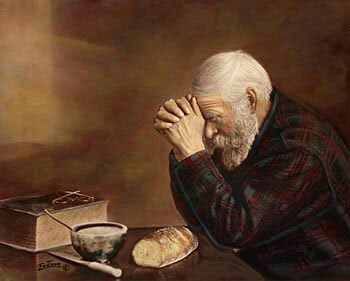 For one, the tax collector does not allow his sin, no matter how terrible, keep him from prayer. There are too many people in the church today who have become so overwhelmed with their sin they’ve given up on prayer altogether. This is a ruse of Satan that keeps us from a life of liberation and blessing in Christ. Second, the parable shows us that our prayers do not have to be grandiose. Like the tax collector, we don’t have to be in a specific place (temple or not! ), in a specific posture, or speak specific words in order to make prayer powerful. As Psalm 69 attests, even silence in the presence of God is as praise to Him (v. 1; CEB). The tax collector had the right perspective: Prayer is about God, not about himself. Furthermore, the tax collector shows that none of us are alone in having difficulty praying. We all struggle and we all have our own hurdles to overcome. God still anticipates and bids us come, not for the sake of eloquence, but for the sake of spending quality time with Him. God seeks to empower us to pray more often and with boldness.